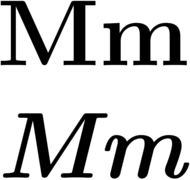 See also: Appendix:Variations of "m"
Modification of capital letter M, from Ancient Greek letter Μ (M, “Mu”). The thirteenth letter of the basic modern Latin alphabet. (phonetics) used in the International Phonetic Alphabet and in several romanization systems of non-Latin scripts to represent the bilabial nasal (/m/), including Cyrillic м (m, “em”), the beginning of various kana including ま (ma), and Korean jamo ㅁ (m, “mieum”). (Roman numerals) The cardinal number one thousand (1000). The thirteenth letter of the English alphabet, called em and written in the Latin script. The ordinal number thirteenth, derived from this letter of the English alphabet, called em and written in the Latin script. Another instance: 2h28m p. m., 10 micra; 3h08m p. m., 0 micra; irrigated with water: 3h09m p. m., 4 micra. The final started with £85m worth of striking talent on the bench as Carroll was a Liverpool substitute and Chelsea's Fernando Torres missed out on a starting place against his former club. The nineteenth letter of the Azerbaijani alphabet, written in the Latin script. The thirteenth letter of the Dutch alphabet, written in the Latin script. Often suggested to be cognate to Hebrew בְּ־‏‎ (bə-), Arabic بِـ‎ (bi-); however, more recent scholarship disputes this on phonological grounds, as Egyptian m is not held to regularly correspond with Semitic *b by either the traditional school of Egyptian comparison or the neuere Komparatistik school. This preposition is often used with the second last definition here to indicate temporary identity, so, for example, z m ꜣhw (“the man is a poor man”) implies that this a temporary, rather than an eternal or generally true, state. Egyptian generally has an expansive view of what counts as a temporary identity compared to English. When the object of the preposition is an attached suffix pronoun, the adverbial form jm is used instead. Possibly originally a verb form, an imperative meaning ‘see’. This particle must introduce a sentence. In Middle Egyptian, it is usually followed by an attached second-person suffix pronoun, such as .k, .ṯ, .ṯnj, or .ṯn, indicating the person being addressed; after this comes the subject, in the form of a nominal subject, a demonstrative pronoun, or a dependent pronoun. In Old Egyptian, a dependent pronoun could be used instead of a suffix pronoun, reflecting the word’s origins as an imperative. James P[eter] Allen (2010) Middle Egyptian: An Introduction to the Language and Culture of Hieroglyphs , 2nd edition, Cambridge: Cambridge University Press, →ISBN, 115, 179–180, 194–195 page 86, 115, 179–180, 194–195. The sixteenth letter of the Esperanto alphabet, called mo and written in the Latin script. The fifteenth letter of the Faroese alphabet, written in the Latin script. The thirteenth letter of the Finnish alphabet, called äm or em and written in the Latin script. The thirteenth letter of the French alphabet, written in the Latin script. L’aube du jour commençait à poindre quand don Quichotte sortit de l’hôtellerie, si content, si glorieux, si plein de ravissement de se voir armé chevalier, que sa joie en faisait tressaillir jusqu’aux sangles de son cheval. The dawn of the day was beginning to break when Don Quixote left the inn, so content, so glorious, so full of ravishment of seeing himself armed a knight, that his joy made him tremble all the way to the girths of his horse. Contraction of mwen, from French moi. The thirteenth letter of the Ido alphabet, written in the Latin script. The letter of the Latin alphabet, written in the Latin script. The twentieth letter of the Latvian alphabet, called em and written in the Latin script. The nineteenth letter of the Livonian alphabet, written in the Latin script. The thirteenth letter of the Malay alphabet, written in the Latin script. a m busa — he/she struck me. The thirteenth letter of the Norwegian alphabet, written in the Latin script. The thirteenth letter of the Portuguese alphabet, written in the Latin script. The sixteenth letter of the Romanian alphabet, written in the Latin script. Representing the phoneme /m/. Preceded by l and followed by n.
The 18th letter of the Serbo-Croatian Latin alphabet, preceded by lj and followed by n.
The twenty-first letter of the Skolt Sami alphabet, written in the Latin script. The thirteenth letter of the Spanish alphabet, written in the Latin script. Marks a verb's object as 3rd person singular. w/, with; Abbreviation of med. Moderate Party; Abbreviation of Moderaterna. The sixteenth letter of the Turkish alphabet, called me and written in the Latin script. The fifteenth letter of the Turkmen alphabet, called em and written in the Latin script. Combining stem of mna used with possessive concords. The thirteenth letter of the Zulu alphabet, written in the Latin script.